Whiskey marketers love to remind readers that Congress, in all its awesome authority, has declared bourbon a unique part of America’s heritage—giving Congress credit for a much fonder attitude toward bourbon than was ever actually the case. This essay is adapted from Bourbon Empire: The Past and Future of America’s Whiskey, published by Viking. In 1964, a piece of legislation declaring bourbon “a distinctive product of the United States” surfaced in Congress. Some lawmakers questioned giving special recognition to this humble, blue-collar drink, and their reluctance was easy to understand: Distilling was one of the most corrupt industries in American history. Congress had recently investigated the industry for links to organized crime, and the U.S. Justice Department had targeted a group of companies known as the “Big Four,” which had grown to control nearly three-quarters of the liquor trade, for monopolistic business practices. Nevertheless, most congressmen came to see the resolution as an innocuous piece of paperwork. 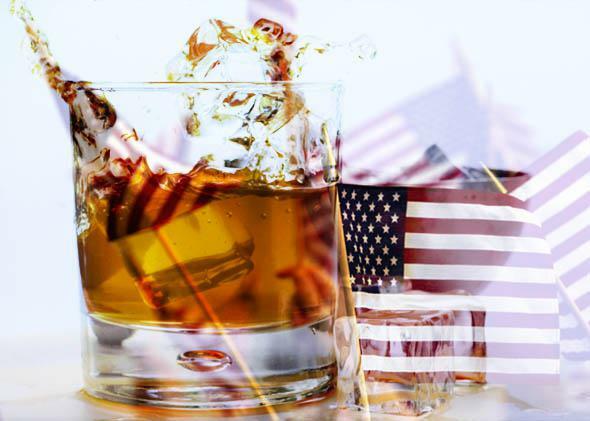 It didn’t seek to enshrine bourbon as a symbol of American values; it simply aimed to designate it as a product that can only be made in the U.S., giving it trade protection against foreign competitors (like the French do for champagne and cognac, and Mexico for tequila). Staffers on the Interstate and Foreign Commerce Committee, responsible for shepherding the legislation through Congress, even came to see it as a bit of a joke, assigning it to a handler who didn’t know anything about the liquor trade but was named August Bourbon—his clever bosses couldn’t resist the coincidence. The resolution passed, made a quick blip on the back pages of a few newspapers, and was quickly forgotten. The real story behind the how bourbon became “America’s native spirit” is far less romantic. Bourbon’s roots are uniquely American—but primarily in the sense that it was cutthroat capitalism that earned the spirit its modern reputation. This was a disaster from a business perspective, causing the Times to run the headline “Whisky Industry Is Facing a Crisis.” Even though Americans were drinking plenty of whiskey, demand was dwarfed by supply. Federal law at the time required distillers to pay taxes on whiskey after aging eight years, at which point it had to be sold or destroyed. If Rosenstiel were forced to sell to a market with weak demand, he might have to do so at a loss, causing others to slash prices to compete and shuttering large portions of the industry in the fallout. Rosenstiel looked for help from his counterparts from other companies within the Distilled Spirits Institute, the industry’s main lobbying group. He wanted tax changes allowing him to age his whiskey longer and give him time to sell his surplus. Such a rule change would have been good for the entire industry, but the other liquor chieftains balked. They were trying to block Rosenstiel’s next move: positioning his older bourbon as a luxury good to capitalize on markets created by the booming postwar economy. Sidney Frank, Schenley’s vice president and Rosenstiel’s son in law, had told reporters about the strategy, and the other DSI members wanted temporary provisions preventing Rosenstiel from advertising his older products until they had a chance to catch up. The other liquor titans were attempting to undo their competitor, but Rosenstiel was not easily defeated. He quickly outflanked his DSI adversaries by forming an alternative lobbying group called the Bourbon Institute. Working swiftly, the Institute successfully lobbied for passage of the 1958 Forand Act, which made whiskey taxes due at 20 years instead of eight, buying Rosenstiel precious time. In the long run, it would also give distillers more flexibility to create some of today’s most noteworthy brands, although the competitive advantage it gave to Schenley, underwritten by the government, temporarily stoked “the fury of the three other big distilling companies,” the Economist reported at the time. The Forand Act in place, Rosenstiel looked for other ways to sell his bourbon surplus. Overseas markets beckoned, and the Bourbon Institute began its work on the resolution to declare bourbon a “distinctive product of the United States” and protect it from foreign competition (indeed, one of the resolution’s opponents was a New York politician representing two Manhattan heiresses earning royalties from “bourbon” imported from a Mexican distillery). As the Bourbon Institute laid its groundwork, Rosenstiel poured $35 million into a global advertising campaign and sent promotional cases of bourbon to U.S. embassies around the world. His competitors in the other three big distilling companies, by this point burdened with their own surpluses and waning domestic demand, followed his lead. (By 1973, DSI, the Bourbon Institute, and another trade group would merge to form DISCUS, the industry’s main lobbying arm today). In May 1964, the resolution passed, and Rosenstiel retired several years later as one of the richest men in the country. Eventually, the legislation he had guided with his invisible hand would be reimagined as the sort of heartwarming tale of craft and heritage the industry generally prefers. But like all American history that gets reshot with a softer focus and better-looking cast, the real backstory of how bourbon became designated as an American original is a little more complicated. It doesn’t feature Basil Hayden, Evan Williams or any of the other marketable frontiersmen who would later inspire famous brands. Instead, it stars Lewis Rosenstiel, a man who prowled around his office in the Empire State Building sporting the kind of amber-tinted eyewear you might associate with old-school bookies working Atlantic City. His image has never made it onto a bottle of bourbon, even though his business savvy was responsible for selling an awful lot of the stuff. Copyright 2015 by Reid Mitenbuler. Adapted from Bourbon Empire: The Past and Future of America’s Whiskey, published by Viking. Reprinted with permission.